We’re already well into April – the month in which club action is meant to hold sway within the GAA – and this weekend sees the start of the 2019 club Championships at both Senior and Intermediate level. Only one round of group matches in both the SFC and IFC will be played this month. While League club matches will continue to be played over the coming months, after this weekend’s initial round of games the Championships will remain on hold until the end of the year’s inter-county action. Here are the choices on offer in the first round of the Senior Championship this weekend. There are plenty of interesting clashes to choose from on that list. 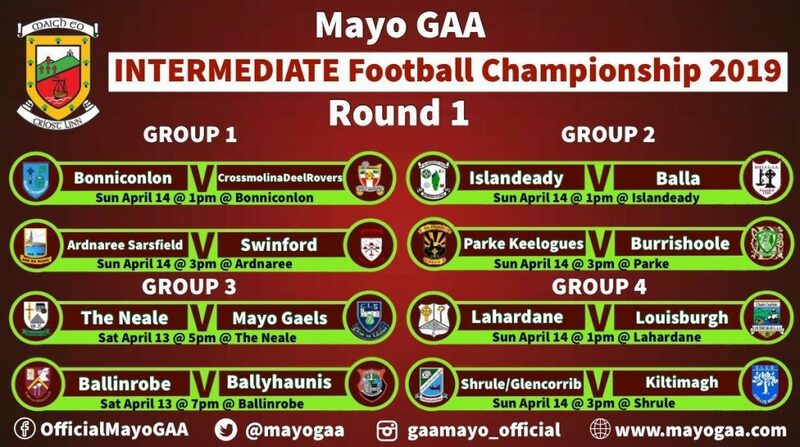 Group 2, in particular, looks quite appealing, with traditional heavyweights Castlebar Mitchels and Ballina Stephenites squaring off in Castlebar while Aghamore host Westport. Both matches are on at 5pm tomorrow. Neither Castlebar nor Ballina have started the League too well – Mitchels were thumped 1-20 to 1-11 by Breaffy last weekend, having narrowly beaten Westport in their opener, while Stephenites have lost twice, to Aghamore and Ballintubber – so both will be eager to get a good start in the Championship. 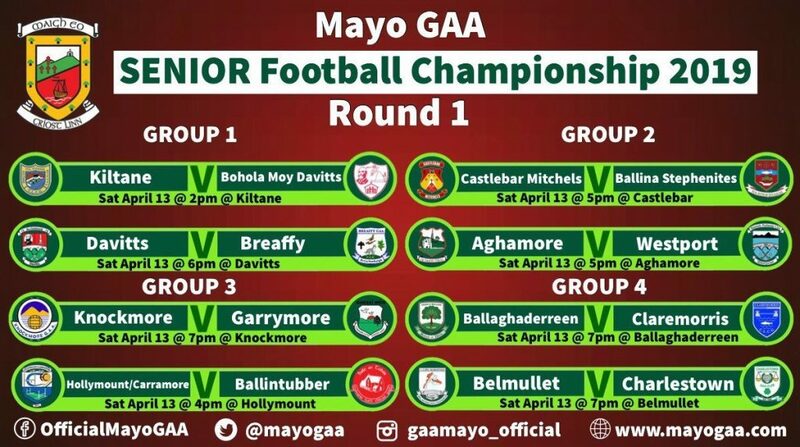 Aghamore, meanwhile, have two wins from two in the League (as well as beating Stephenites they also got the better of Knockmore) so will be aiming to use this momentum to get them going in the Championship. Westport’s sole return from the League to date was a draw with Claremorris last time out. The Aghamore/Westport match is, by the way, being streamed free of charge by Mayo GAA TV tomorrow, with coverage starting at 4.45pm. Full details on this here. 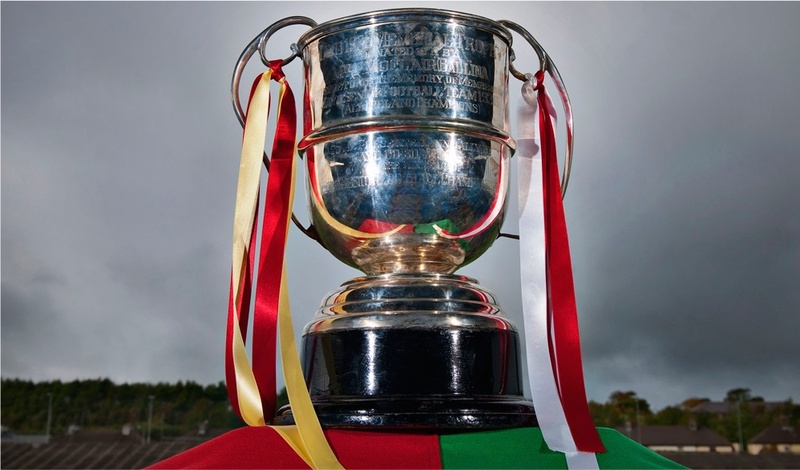 Other fixtures to catch the eye this weekend include the derby clash in Group 3 between Hollymount/Carramore and Ballintubber, which throws in at Hollymount at 4pm tomorrow and which could feature the long-awaited return to action of Cillian O’Connor, as well as the Group 4 meeting of promoted Belmullet and Charlestown Sarsfields. That match throws in at Belmullet at 7pm tomorrow evening. In the Intermediate Championship, meanwhile, this is the list of games down for decision over the weekend, with most of these fixtures taking place on Sunday. As in the SFC, there are plenty of fascinating clashes to choose from here. For example, how will relegated Crossmolina do against Bonniconlon? Or what about promoted Balla who take on Islandeady? Best of luck to all the clubs taking part in Championship action this weekend. Finally, many of you will have heard by now the sad news about the passing of John Durcan, aka ‘St Patrick’ the Westport man who was such a fixture at so many Mayo matches down the years. His varied and wildly over-the-top match-day outfits, as well as the many topical and witty homemade banners he displayed, to say nothing of his trademark bodhrán, brought colour and individuality to every game he attended. May this great supporter of Mayo rest in peace. “St. Patrick” stuck it out to the bitter end. I saw him not too long ago being wheeled in at MacHale Park. A die-hard supporter to the end. May he rest in peace , a right good character who put manys a smile on faces down the years . Your memory will live on at McHale park for many years mo chara. Your memory lives on with us St. Patrick. He was a great familiar sight on match days. I wonder does Kieran Donaghy still have that wooden spoon of his? Brought colour and laughter to many a game. His son Bobby wheeled him to his last matches when he could no longer make it himself. A true Mayo supporter to the end. 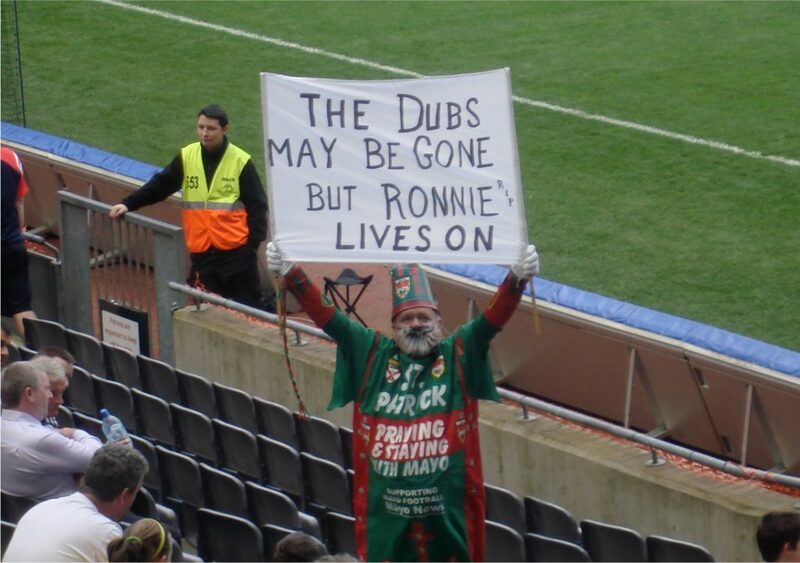 Absolutely as regards John, aka Saint Patrick, RIP… will be remembered fondly by all Mayo supporter’s. Played a much bigger role than most into making us Mayo supporter’s, the most colorful, the best humored, the loudest and the most resilient in the history of the GAA…. Hope that he got to see, Diarmuid and Co climb the steps of the Hogan Stand to finally lift Silverware! John Duggan RIP. He was a great supporter of the green and red and he got a great kick out of it for many years. I would find myself looking for the banner and what the message was on it at games he attended. What I find interesting as a story and I’m sure his son would know would be the first occasion he went to a match as St. Patrick. How it came about. RIP to John. Anyone at any club game this eve? Wasn’t at any Mayo club games as I live in Dublin . Reports are Cillian togged and came on scored a point ,rattled the woodwork and hit the side netting also. Great to hear he’s back . Ballina drew with Castlebar which was a bit of a turn up , ballagh beat claremorris by a point , aghamore and Westport played out a draw with Alan Freeman getting motm and I think belmullet beat Charlestown . Thanks for posting the Mayo News article. The club football was badly affected by the weather. Rest in peace St.Patrick! He always brought it thats for sure! I was in cong yesterday. The neale were a far supetior outfit. I have to criticise john Finn…. he did not let the game flow which led to it not feeling like a championship game! The neale should have won at a canter but let the abbey men back into it. They were lucky time was up after they got the goal. I think the gaels may struggle…. To my knowledge there is no rule in the book which required the ref to let a game flow. Am I mistaken here on this. It might be shorthand for 2 teams who were not up to speed with the basic rules of the game. Rugby is a great game very technical and yet you do not have a situation where the flow is down to the ref. Almost always the players and the coach that get the stick in that code? There is an advantage rule in gaelic football, not being used by referees. Same thing happened at two other games, referees are blowing for everything and it’s stop start all the time. The ballinrobe ballyhaunis game in the second half was terrible, game held up by injuries (, time wasting really) and a whole pile of subs coming on. Ref played two and a half mins injury time. More like 10 mins. Same happened with aughamore and westport, very little time added. Fionn McDonagh didn’t play for Westport yesterday and Mattie Ruane didn’t play for Breaffy. Both injury related I would assume. Keith Higgins did not play for ballyhaunis-ankle injury. 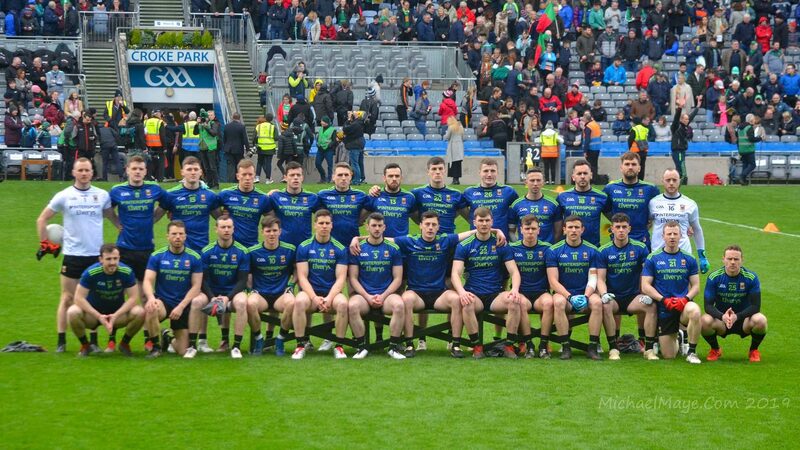 I was at the Breaffy v Davitts game, Matty Ruane injured and didn’t start, Breaffy very comfortable throughout and looking real contenders again this year. Liam Irwin kicked 3 fab frees into a very stiff wind and scored a few more from play, he really has the talent to go all the way if he could get himself fit! Could make the difference for Breaffy this year if he stays with it. Davits tried hard but were always playing catch up, felt like Breaffy only in third gear! That injury is not good news for either Breaffy’s or Mayo’s summer campaigns..
45, has word been released on Ruane’s injury? Is it serious? @Gerard Golden, The last 3 League matchs, Mayo played AOS and Mathew Ruane in midfield…. Their performance’s there had the Mayo supporter’s delighted Mathew and Aiden if both fully fit would take shifting from these positions .. I have seen Jason Gibbons at times playing fantastic stuff around the middle both for Ballintubber and Mayo, who knows when he might get an opportunity again? .SOS has been out recently with an injury, Tom Parsons is recovering from a long term injury., Mathew Ruane, Despite been in excellent form didn’t line up on Saturday for Breaffy, ..This year’s Championship will be much more condensed than previous years, Super Eight’s to get through, and an All Ireland Final to be played before the end of August…. 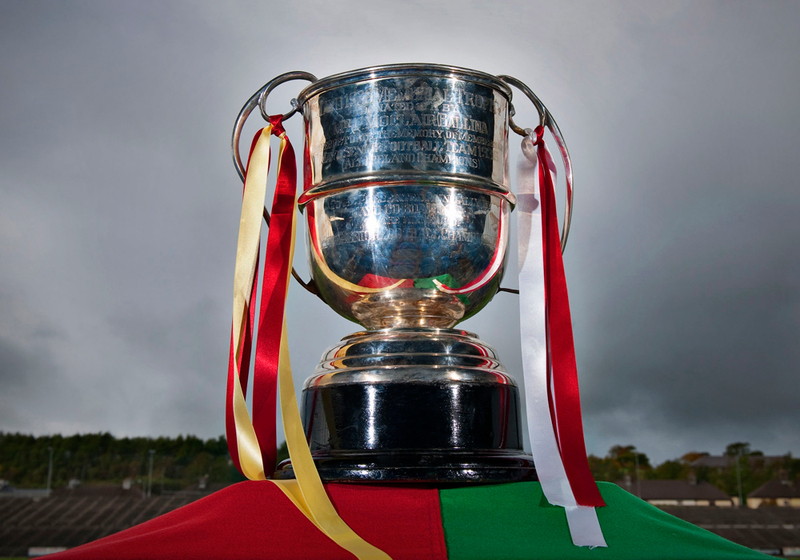 Jason Gibbons and others, could very well see playing time for Mayo before the end of the Championship…. Good Luck to them All, I worry more about injury to Mayo Player’s when their not playing for Mayo,than I ever do when they are! .Something about the unknownable always bothers me!…. One thing for certain is that, whoever comes out of this year’s Championship with Sam is going to need a big and flexible panel of Player’s… I see in that in Donegal that Odhran MacNiallias has opted out of the Donegal County Panel for this year, citing that he just doesn’t have the hunger to give the nessary commitment right now. . His Club Team Gaoth Dobhair reached the All Ireland Club Semifinal,…He is a brilliant player and certainly a loss to Donegal, but concidering the length of the Club Championship and a County League and Championship, it’s not surprising that the hunger could just burn out….We have been very lucky in Mayo, the length of time that so many of our players have committed to the Mayo cause year after year!.. Despite the setbacks, takes doing, and should be appreciated by all!